A fine view of this Metroland-style development can be seen on EPW061115, taken in May 1939, and looking south from above the Bushey UDC Sewage Works. Oxhey Golf Course is viewed in the middle distance, with Oxhey Place and Oxhey Woods in the background. Green Lane leading north-east to Oxhey and Watford. In countrymans terms, a cart has two wheels, a waggon, four. A rare image of the fine 1912 clubhouse on this once-famous Oxhey Golf Course (1912-1952), less than three miles to the south of Watford Town. After lengthy discussions at various club committee meetings throughout the interwar period, the course layout was changed to achieve a better balance between the outward and inward halves for the start of the 1936 season. The first hole was the former seventh and the second hole the old second and so on. This was the official layout until the drastic changes in the difficult post-1945 years and the construction of the massive South Oxhey housing estate. 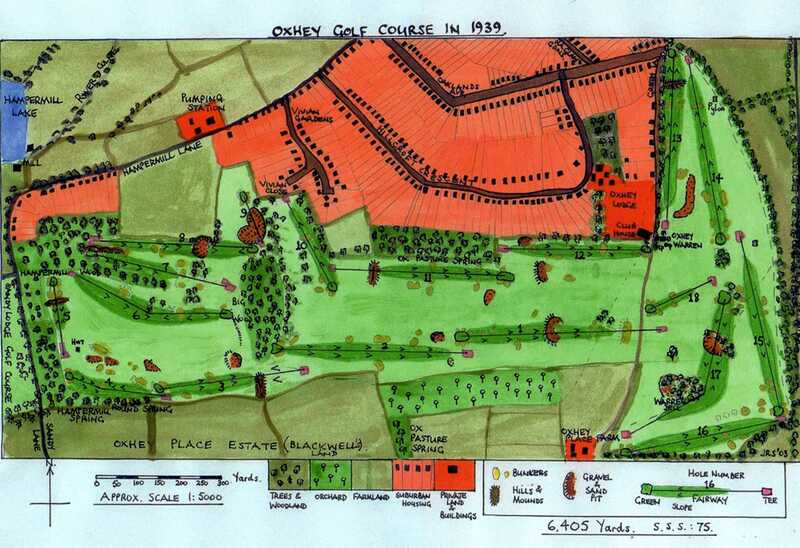 This plan was prepared by the writer in 2003 and the framed original is currently on display in the Oxhey Park Golf Clubhouse, Prestwick Road, South Oxhey. After lengthy discussions at various club committee meetings throughout the interwar period, the course layout was changed to achieve a better balance between the outward and inward halves for the start of the 1936 season. The first hole was the former seventh and the second hole the old eighth and so on. This was the official layout until the drastic changes in the difficult post-1945 years and the construction of the massive South Oxhey housing estate. 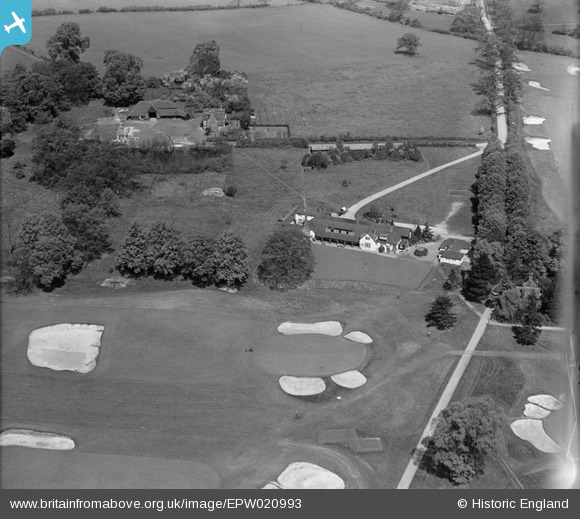 A view, looking north towards Oxhey Hall, of Oxhey Golf Course (1912-1952) during its heyday in the late 1920s. The spacious clubhouse has survived intact and is now a popular restaurant called "The Pavillion". The 18th hole (429 yards) is on the south side of the clubhouse, with the green surrounded by four bunkers. 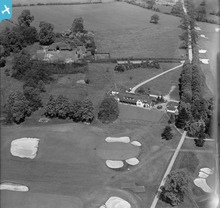 The track leads to Oxhey Place at the bottom of the photograph, with bunkers protecting the sixth green just visible on the right. The first hole (407 yards) extends away in the distance, to the right of Green Lane. On the northern side of the clubhouse is a cluster of farm buildings associated with Oxhey Lodge, beyond which is the area of the Oxhey Hall Estate soon to be developed as an area of "Metroland"-style housing during the 1930s.